Happy Spring! Welcome to our new share holders. As we begin another growing year, we hope the weekly blog updates will serve as a good resource along the way. Mother Nature has been relentless in her weather this year challenging even the hardiest of Minnesotans. One of the coldest, in the top 10, and snowiest, 15th, and second wettest April in Minnesota history. So while we remain optimistic and excited about the growing season, each weather challenge has us wondering – what will this growing season be like? We wait for the soil to dry out and to warm up so that the seeds will not rot in the soil but rather grow and flourish. Our planting did begin over a month ago – in pots that is and continues in pots even though the weather has remained chilly. 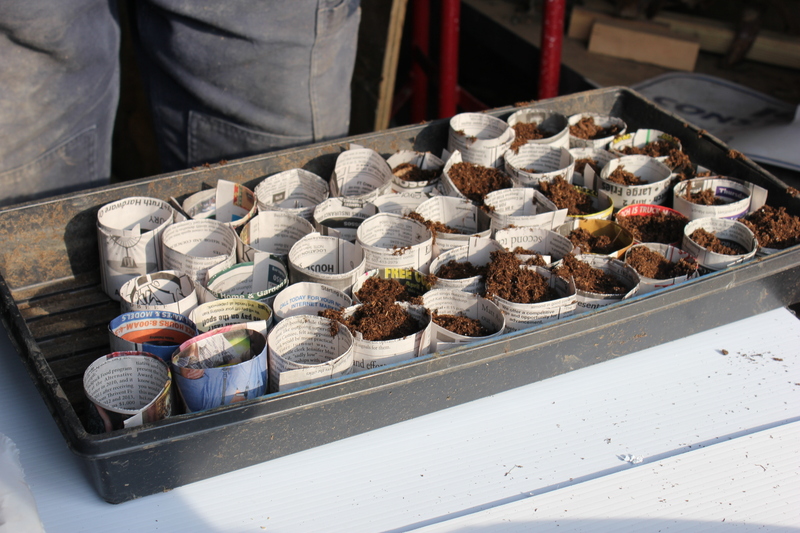 We will then transplant what has started into the soil once the soil and weather conditions are right. As the season, progresses we will keep you posted on when deliveries begin. We are excited to have you as part of this growing journey and hope that you will enjoy the bounties of the garden and learn something along the way. Great news. 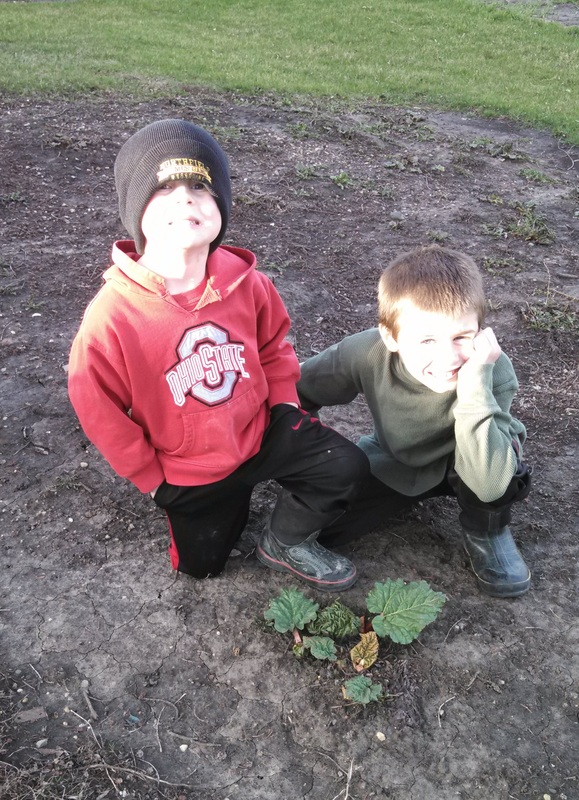 While the weather has still been chilly, and we have not yet been in the garden planting…the rhubarb is growing! Even with snow on the ground, we started planting at the end of March. 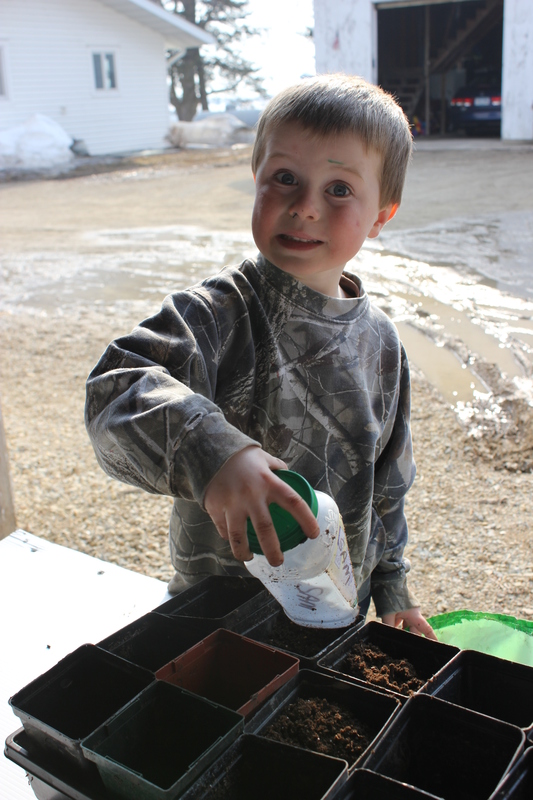 Sam is busy putting soil in pots before planting. 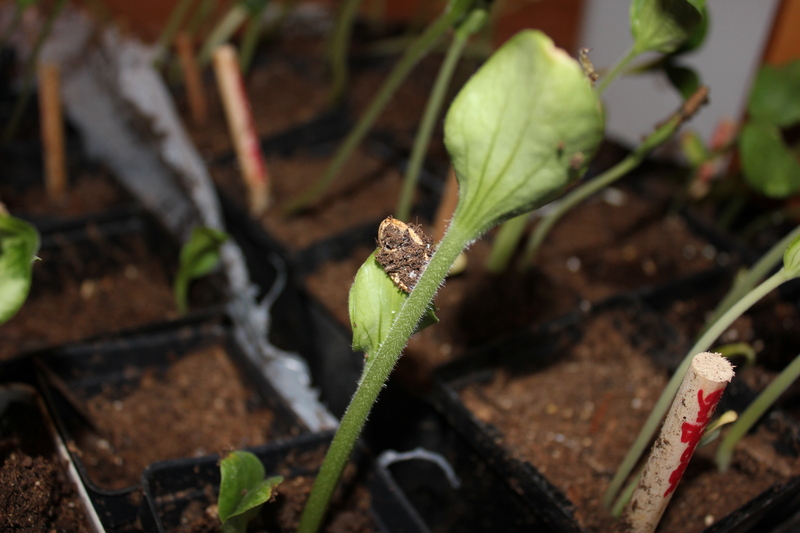 We planted a variety of squash, pumpkins, gourds and cucumbers. We use the Miracle Grow potting soil which has fertilizer and moisture control to help these plants get off to a good start. 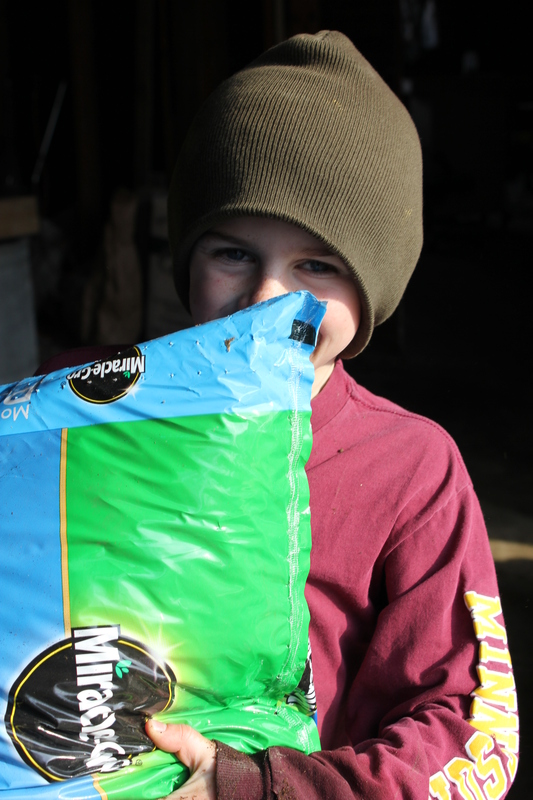 And yes, the boys do sling the bags of soil around. Again this year, Keith and Steve made some of our pots out of newspaper. Because newspaper is made from trees, it will naturally degrade in the soil. It makes transplanting very simple. Just place the pot and plant in the soil in the larger pot or in the garden. When the plants come out of the soil, it is always fun to see how the first leaves, cotyledons, emerge out of the seed pod. See diagram below from realcurriculum.com. 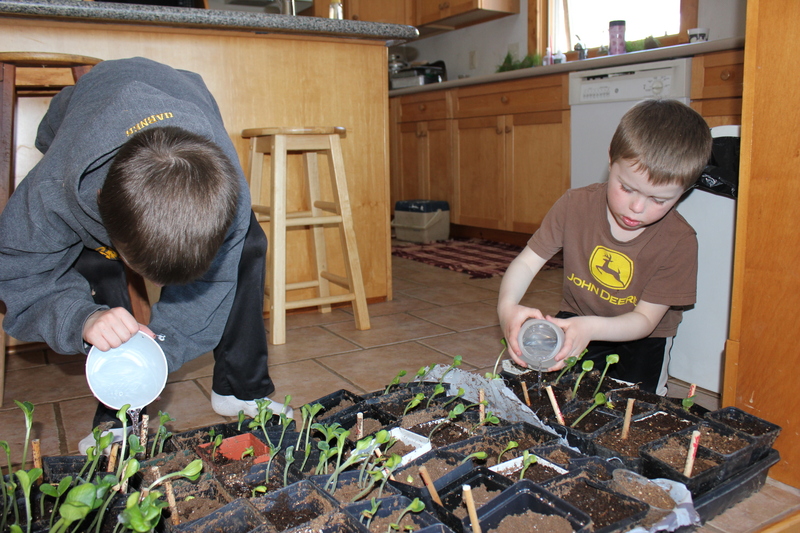 The pots are placed on our heated kitchen floor and the boys are responsible for watering. So while it is cold and wet outside. There are still plants growing, and we are ready for Mother Nature to give us an opening to plant! On another note, the boys are still enjoying their chickens. 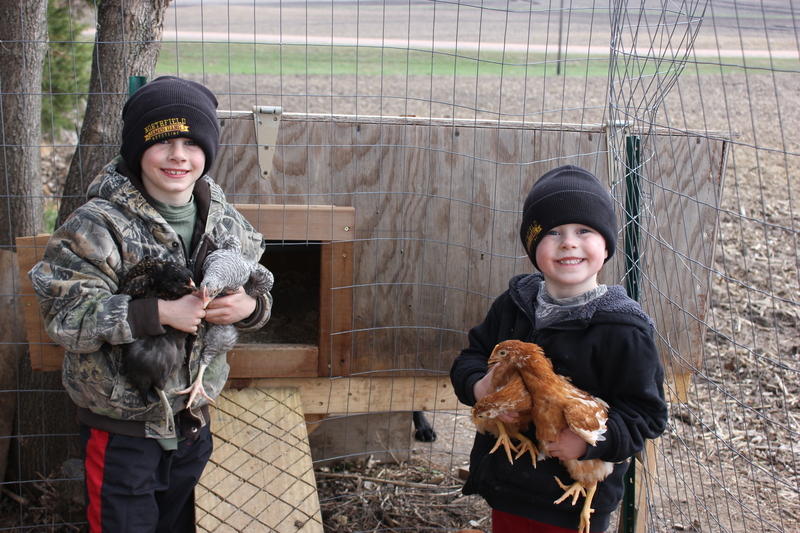 This winter, even in the extreme, cold weather – through Farm Bureau, 4-H and Montessori connections – the boys expanded the flock with a some different breeds of chickens. It has been a good learning experience and one they have really enjoyed. The boys are pictured with the “teenagers” as they call them. They are about two months old – Not chicks and not old enough to be laying yet. They should start laying eggs when they are about 4 months old. Many factors can determine exact timing – weather, environment etc. This entry was posted in Uncategorized and tagged CSA, factory farms, family farms, farming, food, Gardening, gardening with kids, kids in the garden, local foods, Northfield, rhubarb. Bookmark the permalink.